On July 12, 2016, The Akshaya Patra Foundation welcomed the leadership team of NetApp to its VK Hill kitchen in Bengaluru, to recognise their corporate partnership. NetApp, a data management and cloud storage solutions company with offices located worldwide, donated a number of insulated vessels along with other items to facilitate operations. 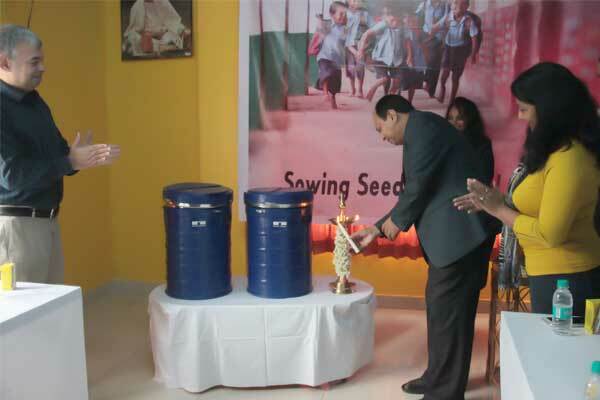 The event took off with lighting the lamp and a tour of the Vasanthpura kitchen facility. As a matter of fact, nearly 40 volunteers from NetApp visit Akshaya Patra on a monthly basis. They spend time from 9:30am to 3pm and contribute in pre-processing activities ranging from washing and cleaning cauldrons, vessels and vehicles to segregating pulses, de-husking coconut, to name a few. The team visited Kagalipura High School and shared a mid-day meal with over 400 students. The beneficiary children were delighted on receiving chocolates and stationery during the visit. “It was an unbelievable experience to see what it takes to do. We are glad to be associated with Akshaya Patra and would like to go a long way and lend support in all possible ways”, said Deepak Visweswaraiah – VP Engineering and Managing Director, NetApp India ,Harish Arora - VP, NB ONTAP Engineering and Sonali De Sarker - Director, Human Resources shared similar enthusiasm and were mighty impressed with the food safety, hygiene and more importantly the love and passion with which this operation is run. A first time volunteer, Srinivas BK said, “Seeing the smiles on their faces made my day.” Other volunteers shared similar insights and described the experience as unique, satisfying and fulfilling.